Welcome to the Peach Regional Chamber! The Peach Regional Chamber of Commerce can help you save money, enhance your knowledge, gain visibility, influence your community and connect with businesses around the region. We are dedicated to enhancing our community as well as your experience here. Our Mission: We are committed to promoting economic development and growth, advancing civic interest and to stimulate a successful business environment through effective leadership by our members and volunteers in our community and surrounding areas of influence. 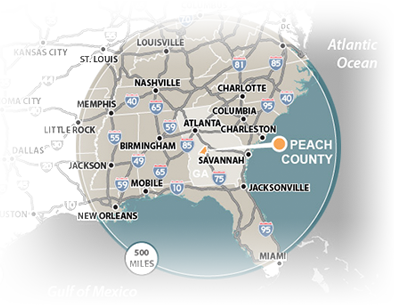 Peach County is a unique blend of the past and the present. It is Georgia's youngest county, and it also holds the historic distinction of being Georgia's last new county. It is growing, energetic, optimistic and progressive ... a place where people from all walks of life can find an environment to suit their lifestyles. It is alive with community spirit, with pride, with excitement and cultural diversity. All in all, it's a great place to live, own a business, work and play. Safely transporting children for over 85 years. 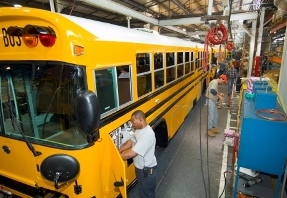 Find out more about who built the first all steel school bus and history of Blue Bird School Buss. An iconic brand, right here in your community!